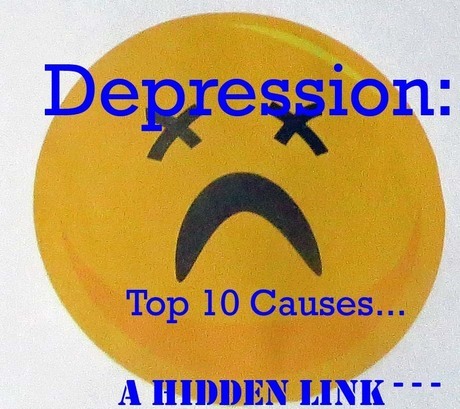 DEPRESSION: THE TOP 10 CAUSES: A HIDDEN LINK that could make you very happy. · Abuse. Past physical, sexual, or emotional abuse can cause depression later in life. · Certain medications. For example, some drugs used to treat high blood pressure, such as beta-blockers or reserpine, can increase your risk of depression. · Conflict. Depression may result from personal conflicts or disputes with family members or friends. · Death or a loss. Sadness or grief from the death or loss of a loved one, though natural, can also increase the risk of depression. · Genetics. A family history of depression may increase the risk. It's thought that depression is passed genetically from one generation to the next. The exact way this happens, though, is not known. · Major events. Even good events such as starting a new job, graduating, or getting married can lead to depression. So can moving, losing a job or income, getting divorced, or retiring. · Other personal problems. Problems such as social isolation due to other mental illnesses or being cast out of a family or social group can lead to depression. · Serious illnesses. Sometimes depression co-exists with a major illness or is a reaction to the illness. · Substance abuse. Nearly 30% of people with substance abuse problems also have major or clinical depression. I didn’t know about the *VITAMIN D missing link until I was diagnosed with breast cancer and had an extensive blood screening at the Cancer Treatment Centers of America. They informed me that while all my other levels were within normal ranges; my Vitamin D level was dangerously low. A normal level is around 75, mine was in the low teens. I am typically a happy, energetic, fun loving good natured person, but lately I’ve been battling terrible depression. I thought perhaps it was due to losing three close family members or going through menopause, but now I know it’s because my vitamin D is dangerously low. The prescription: Get your DEPRESSION checked. It could be your D is low too. I was told to take 5,000 IU of vitamin D per day for six months. They also informed me that I could get vitamin D naturally from the sun, during peak UVB times from 11-1 in just 15 minutes, but due to causing skin cancer said I shouldn’t do it every day. It’s only been a month but my leg cramps are gone and my mood swings way better. I also know that when I’m deficient of my time with God’s SON and studying his word, the Bible, that I suffer spiritually too. When we begin to worship and praise him and get into his presence, our depression seems to melt away, or at least takes a back burner. Two scriptures come to mind: "The joy of the Lord is my strength," and "A Merry Heart doeth good like a medicine." I pray that you too can find the answer to your depression, and hope that this is the hidden link that can bring happiness, energy, and joy back into your life!